As we are planning to launch two additional journals, Hypothesis Matters and Reproducibility Matters, we would like to inform our users about the updated policy on the scoring system for our journals. At ScienceMatters, we are of the opinion that all scientifically sound articles, should be published, regardless of the novelty or perceived impact. Thus, we have decided that the technical quality and scientific rigor of the article will now weigh 50% (instead of 33.33% as in the previous scoring) and 50% for conceptual advance and impact. 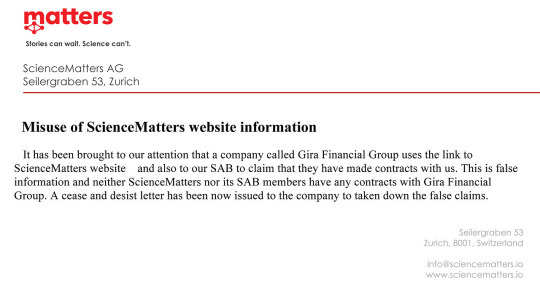 It has been brought to our attention that a company called Gira Financial Group uses the link to the ScienceMatters website and also to our SAB to claim that they have made contracts wiht us. This is false information and neither ScienceMatters not its SAB members have any contracts with Gira Financial Group. A cease and desists letter has now been issued to the company to taken down the false claims. Matters thanks all authors who have participated in our promotional phase and have submitted their manuscripts. You still have one month to get your observation published for free! After that, Matters will charge an article processing fee except for manuscripts from partner institutions. Please see our help page for more details.